There are several ways to pickle salmon. Each of them is interesting in its own way. Whichever method you choose, after 1-2 days it is already possible to enjoy the savory taste of salted salmon. - 4 tbsp of salt. - 1 tablespoon of sugar. - 1 tbsp of vinegar. For pickling it is recommended to use the loin part of the fish. However, some prefer to use steaks or bellies. Whatever you chose, before salting, rinse with water, fish, cloth remove excess moisture. If you have bought uncleaned fish, carefully cut the head and gills, then do some thinning. Milling fish need with a special knife. Salmon should be cut along the spine, starting from the part where the head was. On one part should remain the backbone it needs to be carefully removed. You also need to remove the abdomen. Further, for pickling, you can use one of three ways. The first method. To prepare salted fish for this recipe the skin it should not be removed. 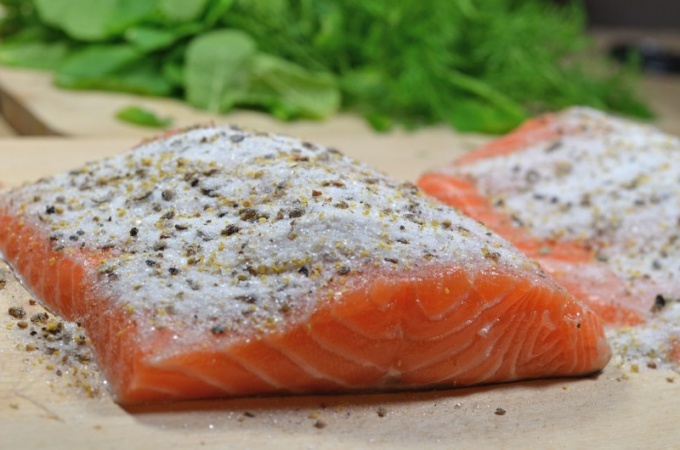 Prepared fillet sprinkle a large kitchen salt or sea salt. Salmon refers to fatty varieties of fish, so to overdo it – it will absorb as much salt as you need, so it's best to sprinkle more than less. Put the fillets in paper towel and store in the refrigerator for at least 12 hours. Took the fillets out of the fridge after a specified period of time, you can see the remains of salt, which can be easily removed with a knife or a cloth, rinse with water, salt is not necessary. Fish can be eaten immediately. The second method. This method involves cooking fish a La carte pieces. Salmon should be cut into small pieces. Also suitable for salting trimmings of fish. A mixture of salt and sugar you need to cover the fish and put under oppression for a few hours in the fridge. This is the fastest way of cooking salted salmon. The third method involves salting using brine. Sugar and salt dissolve in water and bring to a boil. You can add to taste herbs or a Bay leaf. Next, pour in the vinegar and remove from heat. When the brine has cooled, it should drain. Pour the strained brine the fish pieces. Put in the fridge for a day if you want the salmon turned out salted, or two days if you like more salted fish. There are other recipes of salting salmon, for example, using lemon juice or brandy. To do this, RUB the fish fillets with a mixture of pepper, sugar and salt, put in a plastic container, sprinkle with lemon juice or brandy, then cover for 1-2 days in the refrigerator. Every 12 hours you need to flip the fish and change the top pieces in some places from the bottom. So salmon saturated brine evenly and salted much better.